Welcome to Today@WKU, the daily newsletter from WKU Public Affairs, for September 26, 2018. 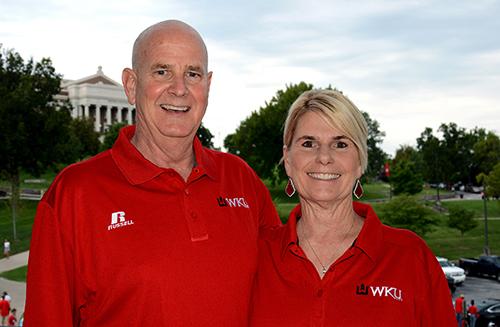 Chris and Sherrie Swanberg establish scholarship for WKU students from Henderson County and Owensboro high schools: When a couple is composed of two WKU alumni, it is not uncommon to learn that they met and fell in love on the Hill. Chris Swanberg, originally from Henderson, and Sherrie Shuler Swanberg, originally from Owensboro, agree that meeting one another is their most special WKU memory. After more than 30 years away from campus, the Swanbergs recently reconnected with WKU and were looking for a way to give back to the University that gave them so much. Inspired by the goal of the WKU Opportunity Fund to remove barriers for access to education, the couple has established the Swanberg Shuler Opportunity Scholarship Fund. The fund will support WKU students from both Henderson County High School and Owensboro High School, Chris and Sherrie Swanberg’s respective high schools, through renewable scholarship opportunities. Toward a Culture of Performance: Check out President Timothy C. Caboni’s campus message to WKU faculty and staff. What’s Happening at WKU: Check out a list of events through Oct. 13. Mexican journalist to receive Award for Courageous International Reporting on Thursday: WKU's School of Journalism & Broadcasting will welcome Mexican journalist Marcela Turati to campus on Thursday (Sept. 27) as the recipient of the third annual Fleischaker/Greene Award for Courageous International Reporting. Area 4th-graders to attend 23rd Progressive Agriculture Safety Days® event Thursday: About 700 fourth-graders from Warren, Allen and Edmonson counties will participate in the 23rd annual Progressive Agriculture Safety Days® program on Thursday (Sept. 27) at WKU’s L.D. Brown Agricultural Exposition Center. Women’s golf: Lady Tops Win at Boston College as Joiner Claims Sixth Career Title: Mary Joiner is 2-for-2 this season in thrilling comebacks, and 2-for-2 in titles. This time she brought her team along for the ride. The junior Joiner stormed back from a six-shot deficit to start the final round at the Boston College Intercollegiate, earning co-medalist honors in a tie for first. Her effort also helped the Lady Toppers win the team title in the 16-squad field. Football: Practice Report: In WKU Football's 28-20 win over Ball State last week, the young offensive line helped the team rush for a season-high 192 yards. Coming off their first win of the season, the Hilltoppers want to keep the same momentum heading into conference play against Marshall on Saturday night. "I thought winning last week was huge, we were really desperate for a win, we just needed something to gain momentum heading into conference play this week," offensive lineman Miles Pate said. Athletics: "Voice of the Hilltoppers" on Temporary Leave of Absence: The "Voice of the Hilltoppers," veteran play-by-play man Randy Lee, is taking a temporary leave of absence from his role as the radio voice of Hilltopper football and men's basketball. A timetable for Lee's return has not been set, but all of WKU Athletics is hopeful for Lee's speedy return to the microphone. Football: Pro Hilltoppers in the NFL: Nine former Hilltoppers are signed with NFL teams, check out what they did during Week 3. New transit study to involve WKU, GO bg Transit: Less than three years after contracting with a consultant to study Bowling Green's GO bg Transit public transit system, the Bowling Green-Warren County Metropolitan Planning Organization is ready to solicit bids on a new study that will include an examination of WKU's Topper Transit system. WKU's quarterback position in flux due to injuries, positive play: Four weeks into the 2018 season, WKU has quite the quarterback conundrum on its hands. All four of the program’s scholarship quarterbacks have played and three of them have all started at least one game. WKU is the only team in college football’s Bowl Subdivision to have started three different quarterbacks thus far. Problem? Well, not yet. 6 p.m.: Represent(ed) Panel Discussion. Beulah Winchel Education Library, Gary Ransdell Hall. Part of Project LIT. Contact Sara Volpi, (270) 745-4502. 7 p.m.: Cuban Film Festival: Juan of the Dead. Cherry Hall, room 125. Part of International Year of Cuba. Contact International Programs, (270) 745-5334. 9 a.m.: Progressive Agriculture Safety Day. L.D. Brown Agricultural Exposition Center. Contact Catherine Malin, (270) 745-3325. 11 a.m.: Domestic Violence Awareness Month Kick-Off Event. Downing Student Union, first floor. Contact Elizabeth Madariaga, (270) 745-3159. 7 p.m. ET: DiscoverWKU Elizabethtown. Hardin County Schools Early College and Career Center, 200 University Drive, Elizabethtown. Contact Admissions, (270) 745-2551. 7 p.m.: Hardin Planetarium Show: Humans on Mars. Hardin Planetarium. Contact Planetarium, (270) 745-4044. 7:30 p.m.: Presentation of Fleischaker/Greene Award for Courageous International Reporting: Mexican journalist Marcela Turati. Gary Ransdell Hall Auditorium. Contact School of Journalism & Broadcasting, (270) 745-4144. Parent & Family Weekend. Various events and locations. Contact Student Activities, (270) 745-2459. 9 a.m.: Bowling Green International Festival. Circus Square Park. Contact Bowling Green International Festival, (270) 779-3830. 11:30 a.m.: Southern Kentucky Team Penning. L.D. Brown Agricultural Exposition Center. Contact Ag Expo Center, (270) 745-3976. 4 p.m.: WKU Alumni Tailgate & Celebrate. WKU South Lawn. Contact Alumni, (270) 745-2586. 6:30 p.m.: WKU Football vs. Marshall. Houchens Industries-L.T. Smith Stadium. Contact Athletic Communications, (270) 745-4298.